Valiant Comics does a fantastic job of creating entry points for new readers. 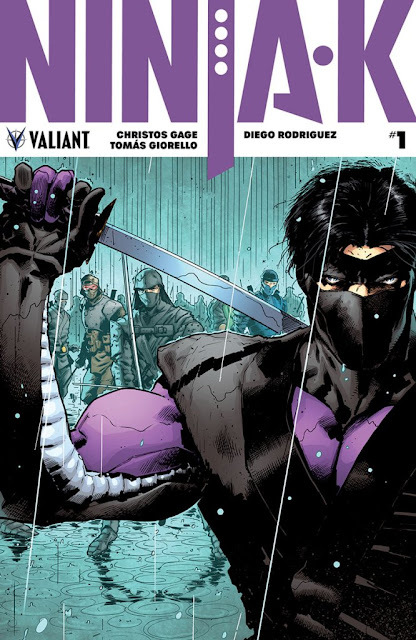 The latest relaunch is 'Ninja-K' by Christos Gage and Tomas Giorello and it's a supremely told story that's dense in mythos full of intrigue, conspiracy, and amazing ninja action. The issue opens up with a crash course about MI6's Ninja Programme. It's fascinating in its own right not just to serve as backstory. It covers several eras while establishing a mentor for Colin King, the current Ninja-K, who is mysteriously murdered. It sets off a string of events that results in dead agents and a deeper conspiracy. King's investigation leads to more questions and a possible killer on the loose determined to keep former ninjas quiet forever. This new volume follows the run by Matt Kindt and Gage picks up the torch with aplomb. He frames the story through King's relationships, a romantic one, and professional ones. He's not fully invested in his relationship with Livewire and she lets him know she knows. Neville informs him that Ninja-D is dead and he needs to be protected. King scoffs at the idea and seeks out the remaining living ninjas for more information. Gage reveals King's character - stubborn, confident, untrusting, determined, fearless - in this opening chapter that sets the foundation for the series. The cat and mouse game between an unknown assailant and Ninja-K ramps up slowly but explosively by the end of the first issue. It's a gripping read that will have you hooked. Giorello's art is astonishing, full of detail and varied perspectives. There's never a dull moment thanks to the engrossing visuals. Even when two characters are talking to each other, each panel is fresh and alive with a new approach. Diego Rodriguez's colors add depth through mostly warm earth tones with occasional splashes of reds and oranges. The script is great but the art just magnifies the story with eye-catching layouts. 'Ninja-K' blends the best of different genres into one tour-de-force adventure. Spies, ninjas, assassins, intrigue, corruption, action, and mystery all rolled into one. There's never been a better time to be a Valiant Comics fan. 'Ninja-K' is your gateway to a cinematic blockbuster you can hold in your hands. Make sure to pick it up and every month.